The last spot we visited on Maui was the ʻĀhihi-Kīnaʻu Natural Area Reserve. 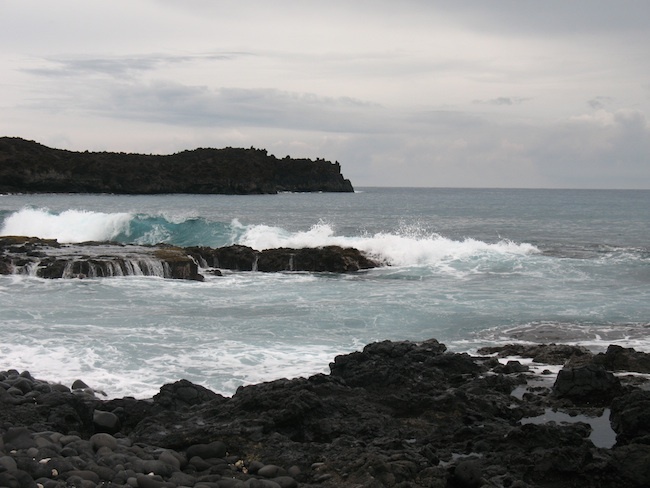 This protected area is located pretty close to the extreme southern point of Haleakalā. It encompasses a slice of land from the uplands down to the coast, and then into shoreline waters. This combination of land and water makes it unique among protected areas in Hawai’i. ʻĀhihi-Kīnaʻu NAR is located on the southwest rift zone of Haleakalā, which is still an active (though dormant) volcano. In fact, the most recent eruption of Haleakalā flowed through this area, a few hundred years ago (radiocarbon dating suggests this flow is probably older than a traditionally-thought 1790 date). A very young vent, Kalua o Lapa, is a prominent feature upslope from the shoreline, where the hiking trail is located. Youngest lava flow on Maui. While ʻĀhihi-Kīnaʻu NAR is largely covered by young lava, there are numerous cultural sites, including, walls, temples, and former garden plots; also, threatened and endangered native dryland plants. This dry and rugged land was inhabited- people once fished and farmed in this area. It’s strikingly similar to the west coast of Hawai’i Island in topography, geology, and general setting. There is a small blowhole at the edge of this bay- we didn't get a good photo of it, though. It’s the aquatic resources of ʻĀhihi-Kīnaʻu NAR that are most known- coral reefs, surf spots, and anchialine ponds. Sea turtles, dolphins, and monk seals frequent the area, and the offshore waters are part of the Humpback Whale Reserve. However, these coastal sites are so well known that they’re currently closed to visitors. If there are any natural areas that are being “loved to death,” ʻĀhihi-Kīnaʻu’s reefs and pools are definitely among them. Currently, you can visit two areas of the reserve: a swimming/surfing area at the entrance to the reserve, and a short trail that goes past a number of cultural sites to La Perouse bay. This is the trail that we took. 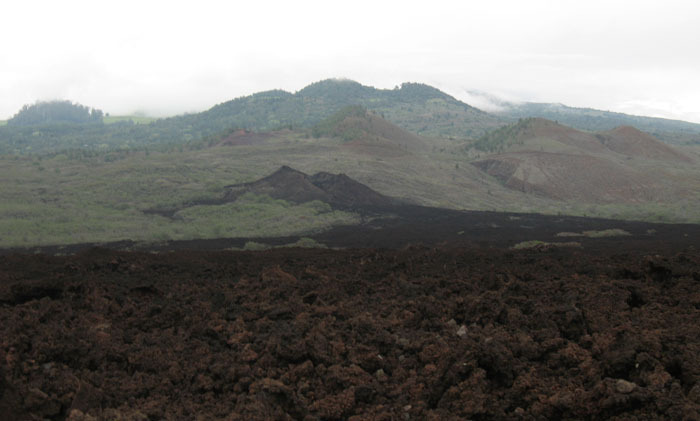 The trail hugs the coast, crossing both rugged ‘a’a and smooth pahoehoe lava flows. As you walk along the coast, there are a few tiny pockets of tan coral sand- the rest of the shoreline area is rocky cliffs, boulder-strewn beaches, and one larger sandy beach with a mix of black and tan sand. While we were there, clouds were rolling in, part of the rain system that had been raking the islands all weekend. We walked past several crumbling rock walls and other structures (evidence of the need to better protect the historical sites of the area). Kaho'olawe, with clouds rolling in. We went on the trail as far as a cobble-covered beach, passing through a kiawe forest full of noisy Gray Francolins and sharp-horned feral goats (the latter a bane of existence for the remaining native vegetation). A tour group on horseback passed us, coming back; they were turned back by a huge fallen tree in the road that we had to scramble under. Fresh black basalt cobbles predominated at the beach, but there were also large chunks of wave-rounded coral, hinting at the productive reef that lay just out of sight. 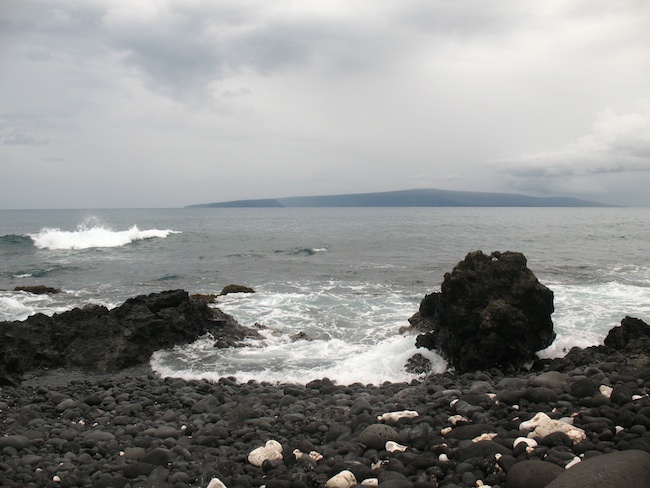 Upslope, we saw Haleakalā disappearing into the encircling clouds; out towards the sea, waves crashed onto shore. I’d love to come back here some day and spend more time in the area. It reminded me strongly of the Kona Coast. While access to the most critical natural resources is limited, there are still other hiking trails that appear to be open, which we didn’t have time to explore. Definitely a place to come back to, at some point.